Everyone wants a healthy, bright smile, right? Whether you have a big event coming up and want to brighten your teeth, or it’s just time to refresh your smile, there are several ways you can naturally whiten your teeth. At East Pershing Dental, you can come in to visit our friendly staff for teeth whitening, or you can try these simple solutions at home. But before you try any of these techniques, it’s best to consult with your Cheyenne dentist to ensure that your teeth are healthy, plaque-free, and cavity-free. First, Why do Teeth Stain or Turn Yellow? Enamel is the strong, outermost layer of your teeth. Beneath the enamel, is dentin, which is a hard, yellow material that carries the nerves in your teeth. As you consume certain foods and drinks, these layers can break down, revealing a yellow color from the dentin. While the following teeth-whitening methods may help brighten your teeth, it’s important to remember that preventing stains and visiting a dentist regularly is just as important. Found in many kinds of toothpaste already, baking soda can do wonders for your teeth. The mild abrasive can brush away stains on your teeth from coffee, wine, or other foods and beverages. Mix one teaspoon of baking soda with two teaspoons of water and use this paste to brush your teeth. This method will take some time, but doing this a couple times a week combined with regular brushing, you will slowly begin to see whiter teeth. Baking soda can also prevent bacteria from forming because of its alkalinity. Dilute apple cider vinegar with some water and use it as a mouthwash. Rinse your mouth with plain water as well afterward. The active ingredient in vinegar, acetic acid, has been used as a disinfectant, natural cleaning product, it kills bacteria, and can help brighten your teeth. Keep in mind, though, that continued use can soften the enamel, so be sure to visit your dentist regularly. A healthy addition to your diet whether you’re trying to whiten your teeth or not, some fruits and vegetables have the added benefit of being great for your teeth. Strawberries: This method hasn’t been backed by science, but it’s a tasty and fun way to get in some fruit. Mash up some strawberries and mix it with some baking soda to use as a toothpaste. This should not replace brushing with a traditional toothpaste. Pineapple: Mash some pineapple and mix with some baking soda. Some claim that enzymes in the fruit remove stains. Vegetables, in general, will help rub away plaque and keep your body healthy. 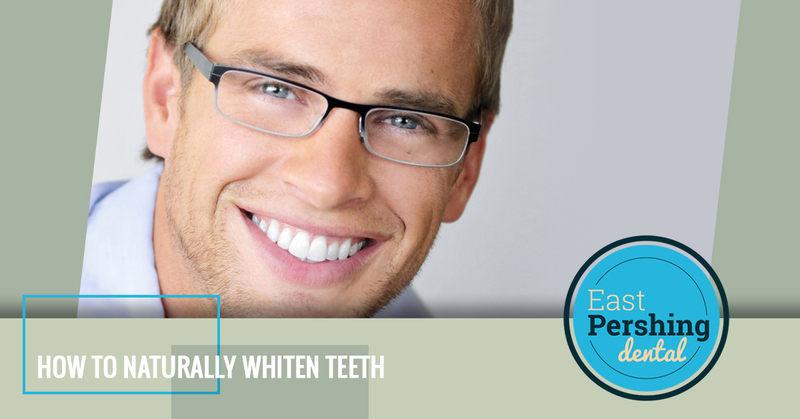 There are many claims that the above teeth whitening methods work to give you a brighter smile. However, they aren’t scientifically proven. 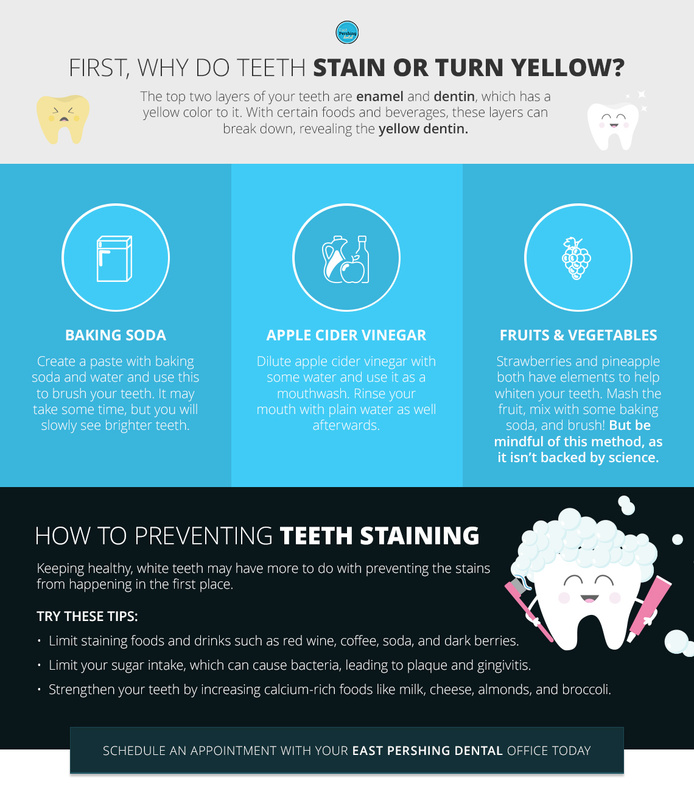 So how can you prevent teeth from staining in the first place? Limit Staining Foods and Drinks: The worst teeth-staining culprits are coffee, red wine, soda, and dark berries. But this doesn’t mean you have to rid them of your diet completely (except maybe soda). If possible, try to limit the amount you are consuming, or use a straw when drinking staining beverages. Limit Sugar: Sugar can lead to the growth of Streptococcus bacteria, which can cause bacteria, which leads to plaque and gingivitis. If you do consume sugar, try to brush your teeth immediately after. Increase Calcium: Strengthening your teeth is a great way to start preventing stains. To protect the enamel on your teeth, increase calcium-rich foods like cheese, milk, and broccoli. The dentists at East Pershing Dental want you to love your teeth! Whether you want to try these teeth-whitening methods, or if you want to visit us for a professional whitening treatment, you should always be confident in a healthy, bright smile. If it’s been a while since your last dentist appointment, give your local Cheyenne dentist a call today for a cleaning.